There is an old axiom about how to cook a bullfrog. You can’t just pop him into boiling water, because as soon as he hits the hot water he will just spring out and escape. Instead you put him in cool water and gradually raise the heat, and before he realizes what is going on you have him cooked. The same concept of incrementalism has occurred in reefkeeping for the past 30 years. Rarely have there been seismic shifts in how we did things; rather, techniques and equipment have gradually changed as new advances have been made. When we shifted from the Dutch method, using trickle filters, to the Berlin method, using skimmers, the media in the trickle filter was removed gradually over weeks, if not months, in most systems before anyone felt comfortable relying solely on a protein skimmer instead of a trickle filter for filtration. Similarly, as reefkeepers switched from soft corals to SPS corals, very few hobbyists removed all of their soft corals and replaced them with SPS corals over night. It was a gradual process that took years. Festooned with both large- and small-polyped stony corals, the author’s tank is a Marineland Deep–style glass aquarium 72 inches long, 27 inches in depth, and 36 inches from front to back. The same process is now occurring as the hobby shifts from the widespread use of metal halide lighting to LED lighting. Initially LEDs were used as supplements to metal halides to augment colors in certain corals or to spotlight certain parts of a tank. Next they were used as replacements for actinic fluorescent tubes, and it was found that they could bring out colors in corals that had not been seen before. This led to their growing popularity—first in smaller tanks, where their limited intensity would not be a drawback, and then in larger tanks. At first people housed soft and LPS corals in these larger tanks where, again, the limited power of LEDs would not be a drawback, as these corals do not require the high intensity that SPS corals need. Finally, in the past year, the intensity and spectrum of LEDs has allowed them to be utilized in large SPS-dominated tanks. 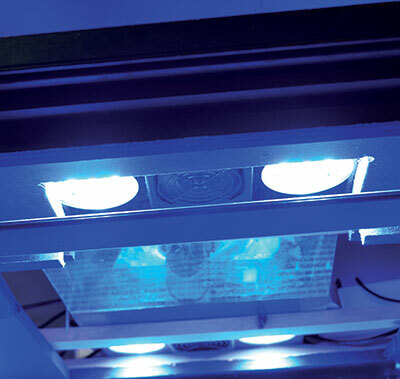 WHY CHOOSE LEDS OVER METAL HALIDES? This question is on many hobbyists’ minds. 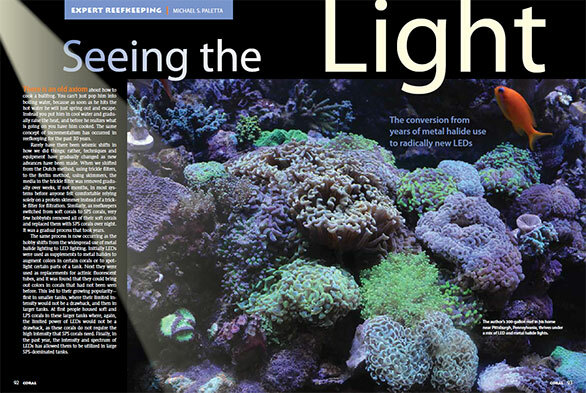 Metal halides have been used successfully since the mid-1990s in just about every reef tank application. 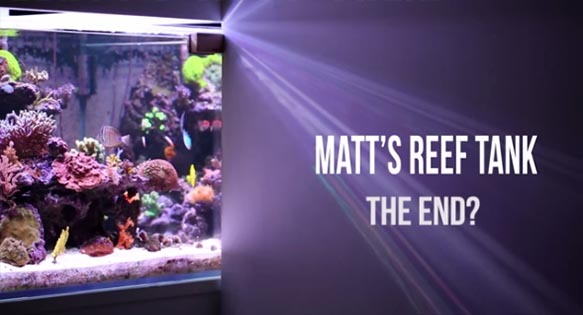 Not only can they be tailored to any size tank due to their being readily available in wattages from 150 to 1,000, but they also come in a wide range of color temperatures from 6,500K to 20,000K, so with these bulbs the reefkeeper can choose any color he or she desires. They are also relatively inexpensive, and they are more or less a plug-and-play item. There are also now a wide range of electronic ballasts and reflectors to make them more efficient to use. Having used metal halides for over 20 years, I was taking a big step to even consider switching over to LEDs on my 300-gallon SPS-dominated reef tank. But despite the benefits of using halides, they also have some wellknown drawbacks. First and foremost is the amount of heat they generate. Running three 400-watt halides over my 300-gallon tank produced, on average, a 3+ degree temperature swing in the tank, even though I used five fans to reduce the temperature increase. (It was not practical to add a chiller to this tank because there was no place to vent the heat it would produce). While these bulbs are quite efficient for producing light per watt of electricity used, which is why they have been the light of choice for SPS tanks for so long, when you add in the cost to cool the tank they are not quite as efficient. And heat generation was not limited to the tank; the room temperature also rose by an average of 5 degrees. While this is fine in the winter, for the rest of the year it required running an exhaust fan to keep the room comfortable. And the discomfort was not limited to the air temperature; since the cooling was being done by fans, the amount of water that evaporated from the tank was in excess of 4 gallons (15 L) per day. As a result it was necessary to employ a dehumidifier for much of the year as well. The average electric bill for my home was approximately $289 per month. Considering all of these factors, I knew it was time to make the leap and convert to LED lighting. The system has been running for three years, but contains some older corals from previous reefs built by the author. Needless to say, switching from my tried and true metal halide setup to LEDs was not a decision I made lightly. I read all I could on the various LEDs available and looked at small tanks using them successfully. Unfortunately, there were not many large tanks out there that had been using LEDs for an extended period of time. I also spoke with people I trusted and considered experts, not just in LEDs, but also in SPS coral husbandry and lighting. I was not looking to switch over to LEDs just to keep everything the same in my tank; I wanted to try and come up with the optimum way of lighting it. The people I spoke with included my good friends Sanjay Joshi, the godfather of reef lighting; Jake Adams; Victor Fornari of World Wide Corals; and Jeff Leung of Aqua World. All of them had lots of experience with different types of lighting and different types of LEDs. The general consensus was that I was little crazy to switch from something so successful to something that still might not be ready for primetime in a large SPS tank. During these discussions, several of the usual LED shortcomings came up: Would they produce enough PAR to result in growth similar to that which I had gotten with metal halides? Would the focused light of the LEDs versus the more diffuse light of the metal halides be a problem? Would the LEDs be bright enough to penetrate the depths of a 300-gallon tank? Could they maximize the coloration of all my corals, or would they enhance certain colors and diminish others? Would the expense of switching to LEDs on a large tank be justified? After numerous discussions, and because I believe in changing and improving things incrementally, I hedged my bets and decided to change the lighting in an unorthodox way. For the last three years that my 300-gallon tank had been set up the metal halides had been the dominant light source, and blue LEDs had been used to augment them and bring out the colors in some of the corals, like the chalices and Acanthastrea. The new lighting system aimed for the inverse of this: the LEDs would be the dominant means of lighting the tank, and metal halides would be used as supplements. I already had the metal halide lights anyway, so the cost of changing them a little would be minimal. Also, this was a way to play it safe; despite the success many were having with LEDS, most of them had smaller, shallower tanks. Since one of my main concerns was whether the LEDs would produce enough PAR to continue to spur rapid growth in this tank, I decided that instead of the 400-watt 20,000K Radiums that I had been using, the new metal halides would be 250-watt 6,500K Iwasaki bulbs, which are close to the color of natural sunlight. This was the setup that Sanjay had run on his tank in the early years. and the growth had been explosive. At a time when many hobbyists were happy just to see their SPS corals encrusting, Sanjay’s grew into such dense masses that he had to chisel them from the rocks. The Iwasaki has been called a “PAR Monster,” no doubt due to the fact that it produces such intensive growth in SPS corals. Once it was determined that I was going to use this setup, I had to determine which LED system I would buy. While there are now countless manufacturers and configurations of LEDs to choose from, they all rely for the most part on LED bulbs made by Cree, so differentiating between them and separating the marketing hype from the truth would be difficult. The best way I could think of to do this was to see as many of these LEDs in action as I could, looking at the coloration of both the tank and the corals as well as taking measurements. After traveling around and inspecting different tanks and setups, I narrowed it down to three manufacturers that met mycriteria. Then, once again, I called up my lighting friends and we discussed the pros and cons of each of the LED fixtures I was considering. There was no consensus among the opinions I sought, just as there isn’t in just about any aspect of the hobby, but after much debate I chose the Radion Pro. It was chosen for several reasons: First, it produced what I considered the best lighting spectrum I had seen over a tank. 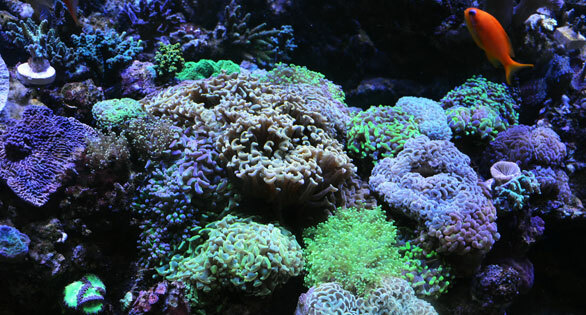 That is, while the tank had the blue cast that I prefer, the colors of the corals remained true. Like most LEDs, it really brought out the blues, purples, and greens in SPS corals, but did so without making pink or yellow corals lose their colors or look faded. This was important, as one of the shortcomings of using the 20K Radiums for so long was that pink Stylophora or Seriatopora corals lost their vivid pink colors when lit by these bulbs over time, and even worse, anything yellow would eventually begin to look green under these lights. Second—and I had learned this the hard way in the past—you can’t just put LEDs over a tank at full intensity and hope for the best. When I had done this in the past with early LEDs, their intense, focused light had produced significant burning and bleaching in any corals below them. The Radion Pro fixture includes software that allows one to gradually ramp up the intensity to the desired level. This software also includes preset templates that can be programmed to match your goals (or your corals) so that you can get maximum growth or coloration or maximize a tank for LPS corals, as well as several other options. And for me there was a bonus: it was all very easy to program into the lights. are mounted 12 inches above the water’s surface. One aspect of switching over that I needed to address was cost. As with everything in this hobby, you pretty much get what you pay for. Like most of us, I do not have an unlimited budget for the hobby, so I did do an analysis of what it would cost to change over before I made the switch to see if it made financial sense. I try to amortize my expenditures over time: I look at what something costs and how long I expect it to be useful and compare it with other options to see if it is cost effective. To myself, I can justify buying anything from a $500 fish to an $800 coral frag, but switching equipment has to make financial sense as well. (One caveat: do not try to explain this to your wife or friends. To date I have never been able to justify any purchase to anyone who is not involved in the hobby.) And if you tell yourself that you are doing this to save money, you are lying to yourself. I say this because I have come to realize that even if I do save money on something in the hobby, I simply use that money to buy something else—so, in reality, I never actually save money, I simply move it to another application. The Radion Pros cost $750 each and I would need six of them to adequately light my 300-gallon tank. So the cost was $3,000. I expect these lights to last at least five years, so the cost per year is $600. The 400-watt Radium bulbs I was using cost approximately $75 each, and they were replaced twice a year, so the cost per year for using them was $450. Therefore, in the worst case scenario, the cost of switching to the LEDs was about $150, or one nice coral per year. I am not including the cost of the Iwasaki bulbs, because I am now running them for only two hours per day, so they will last at least five years. At $69 per bulb, that means it will cost about $12 per year to replace the bulbs. One other aspect of using the LEDs must be considered, however, and that is the cost of electricity. Although my children have never understood that electricity costs money, those of us who pay the bills know it does. Before the switch, it cost approximately $140–$150 per month to run my tank. I was hoping that switching over to LEDs would reduce the electricity required to run the tank, because the reduced amount of heat that these lights produce would reduce the need for fans, dehumidifiers, and exhaust fans, and they require less electricity to run than the metal halides. While I only have a few electric bills to base this on, the outlook is positive: compared to the same bills a year ago, my overall electric bill has been averaging over $73 less. If this continues, switching to these lights could reduce my tank costs by approximately $700 per year. Hello, Earl’s Wrasse! Once the new lighting equipment was obtained, it was time to make the change. Since my tank has a wooden canopy enclosing it, and it had already been customized to hold the metal halide lamps and LED strips, I had to reconfigure it. It was not as easy as I had hoped, as getting the six Radion Pro fixtures, as well as the reflectors for the three 250-watt metal halides, into the space where only three Luminarc reflectors had been required some cutting and rebuilding of the canopy. Fortunately, wood is forgiving, and after almost 30 years of working on tanks I had the skill to fit everything into place; I just had to cut out a few pieces from the canopy and add a few new wooden supports. Next I removed the old metal halide reflectors and replaced them with smaller ones so that there would be adequate space for the Radion Pros. And before the 400s were totally replaced I wanted to see exactly how much of a difference there would be in the overall lighting effect on the tank: not just the quality of the light, but also what the impact on PAR would be. As the accompanying pictures show, the difference between the two types of lighting and the amount of PAR they produce is dramatic. To try and keep things equal, the PAR levels were measured at the tank’s surface at the highest level that could be obtained. By simply looking at the different bulbs side by side, I could clearly see a difference in their color. The Radium looked significantly bluer than anything else. Because it was so blue, I assumed that it was still producing significant PAR. However, when the PAR was measured, I found that the 400- watt Radium was only producing approximately 450 PAR, while the 250-watt Iwasaki produced a whopping 1450 PAR at the same spot. Amazingly, the Radion LEDs produced an intermediate level of PAR, approximately 730. Needless to say, I was encouraged that switching over to the Radion Pros would produce adequate light for the tank. As stated above, the goal of switching over was to try and find the optimal lighting for both growth and coloration in my SPS corals. After seeing these PAR levels it was clear that using LEDs as the primary light and metal halides as a supplement had potential. After looking at and comparing the old metal halides with the new LED/halide combination, I removed all the old halides and put the new halides and LEDs into place. The LEDs were programmed simply by attaching them to my computer, going to the company’s website, and clicking on the parameters for the LEDs that I wanted them to have. This was far easier than I had anticipated and went very smoothly, except that for some reason the clock for the halides would not sync to what the time actually was. I remedied this by simply adding four hours to the time on the LEDs clock, and then everything was synchronized. I set the software to maximize coral coloration and ramp the lights up to 70 percent full intensity over six weeks. Due to the high amount of PAR they produced, the metal halides were timed to come on for only two hours per day. This would coincide with when the LEDs were at their peak as well, so the tank would only get full intensity lighting from both the LEDs and metal halides for approximately two hours per day. The look of the tank during the first two weeks was good, but not great. The LEDs were only at approximately 30 percent intensity for most of this time, so during this period the tank looked a little dull—not the way it would look during full sunlight. However, when the metal halides were on, the difference was dramatic. I had not used 6,500K bulbs for at least the last 15 years because I thought they looked too yellow and harsh. And while they still looked that way compared to the 20K bulbs I had grown accustomed to, now when they came on I thought the colors in the tank looked exactly as they had when I was diving on a reef. The pastel or luminescing colors produced by the LEDs were completely washed out by these bulbs. This took some getting used to, but when there was color it was dramatic. After the halides went off, the colors of the tank and the corals again looked like they had under the 20K bulbs. Now, at the four-week mark, several changes are noticeable. The overall colors of the corals have been enhanced. Even if a coral is taken out of the tank, it has more color than it did before the change. The growth rate of some corals, but not all, has increased. But even in most of those that have not shown an increased overall growth rate, there does appear to be an increase in the amount of encrusting tissue they are putting down on the live rock. Most people who saw the tank before the change and see it now comment that it looks more vibrant and healthier than it did before. I have noticed this too, but since I see the tank every day it is difficult for me to notice subtle changes. 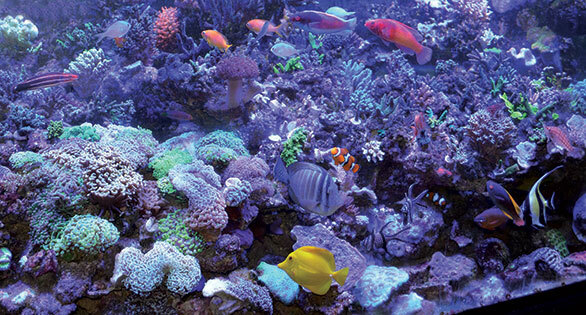 The author’s 300-gallon reef in his home near Pittsburgh, Pennsylvania, thrives under a mix of LED and metal halide lights. As noted, the use of metal halides is not without shortcomings. Primary among these is what to do with all of the heat these lights generate. This discussion has not mentioned the deleterious effect that this wide temperature swings had on my tank. Prior to using LEDs, the tank was kept at 77°F (25°C) at night and would rise to 81–82°F (27–28°C) during the day, summer or winter. In the summer the lights were on a circuit so that if the tank’s temperature got above 82°F they would shut off. Now, with the LEDs as the primary lighting source, the tank is still kept at 77°F at night and rises to 77.8 or 77.9°F (25.4–25.5°C) during the day. As numerous authors have noted, one of the biggest deterrents to longterm success with SPS corals is the inability to maintain a stable environment. Eliminating this daily wide temperature swing will undoubtedly further add to the health of the SPS in this tank. There is also now less than a 1-degree increase in the room’s temperature, and the amount of evaporation from the tank has also decreased dramatically since the halides were replaced with the LEDs. This should further add to the overall stability of the tank; adding 4 gallons (15 L) of water every day to make up for evaporation is probably not the best way to maintain stability. As I have said, a lot went into my decision to switch over from the tried and true metal halides to the relatively new LED lighting. But Sanjay has famously said, “A photon is a photon, and it really does not matter how it is generated.” So if these lights continue to have the effects that they have had during this early phase, over time I hope to show how they have improved not only the color but also the growth of the SPS and LPS corals in my system, but also the long-term stability of the tank. In future articles I plan to explore the impact on the cost of running the tank. As a hobbyist who does not do this for a living, one has to consider all of these factors before making this change. Fortunately, so far I am confident that I have made the right decision. If you would like to see what is going on with my tank, check out my videos on iTunes and YouTube. Like what you read? Don’t miss the forthcoming May/June issue of CORAL Magazine, and be sure to tell your friends! 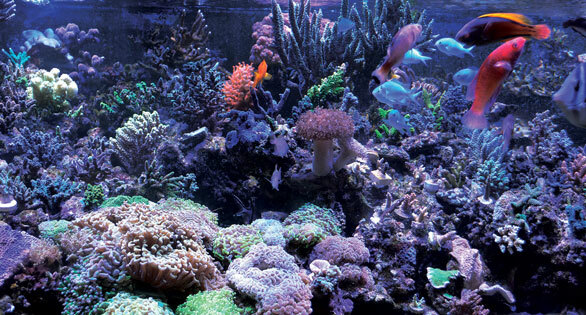 Michael S. Paletta is the author of the bestselling The New Reef Aquarium (Microcosm/TFH, 1999) and a CORAL Magazine contributor, writing frequently about Expert Reefkeeping. He has a graduate degree from Yale University in pharmacology and is employed in the pharmaceutical industry and lives near Pittsburgh, Pennsylvania. I have seen several people come to the same conclusions about LED’s. Except that several have chosen plasma lighting instead of MHL. Great article on lights. Thank you for providing great reading material for your newsletter. Not sure why you would replace your metal halide bulbs every 6 months Mike. You should be getting at least a year out of them. Changing every 6 months makes hobbyists that read this think that this is standard and would make them think metal halide lighting is excessively expensive. In fact a lot of hobbyists report to us that when they switched to LEDs they didn’t see much if any savings in electrical consumption because their heaters were on a lot more. Also, one of our local stores who buys his bulbs from us changes his Radium MH bulbs every 2 years and he reports he does fine with that schedule. We would recommend once a year. Saves money and works fine. Not sure why you would replace your metal halide bulbs every 6 months Mike. You should be getting at least a year out of them. Changing every 6 months makes hobbyists that read this think that this is standard and would make them think metal halide lighting is excessively expensive. In fact a lot of hobbyists report to us that when they switched to LEDs they didn't see much if any savings in electrical consumption because their heaters were on a lot more. Also, one of our local stores who buys his bulbs from us changes his Radium MH bulbs every 2 years and he reports he does fine with that schedule. We would recommend once a year. Saves money and works fine. I have seen several people come to the same conclusions about LED's. Except that several have chosen plasma lighting instead of MHL.